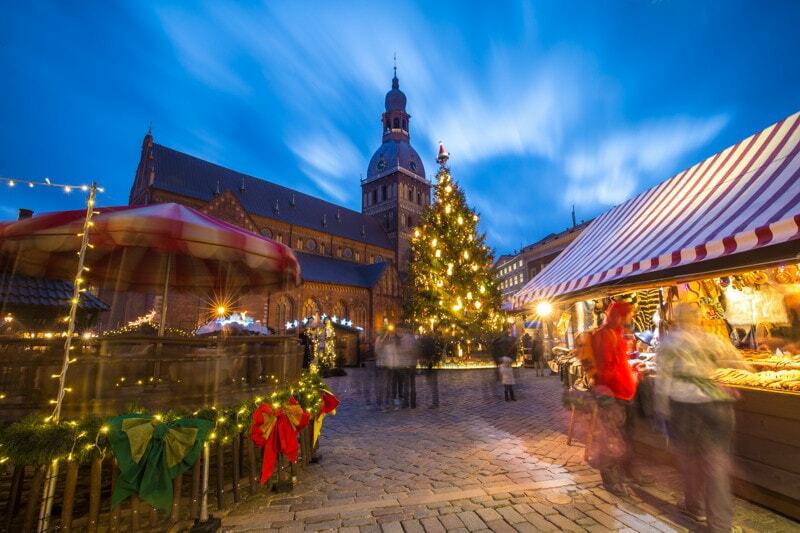 As a part of my Christmas in Europe, I really wanted to spend a lot of time in the cities of the Baltic countries. 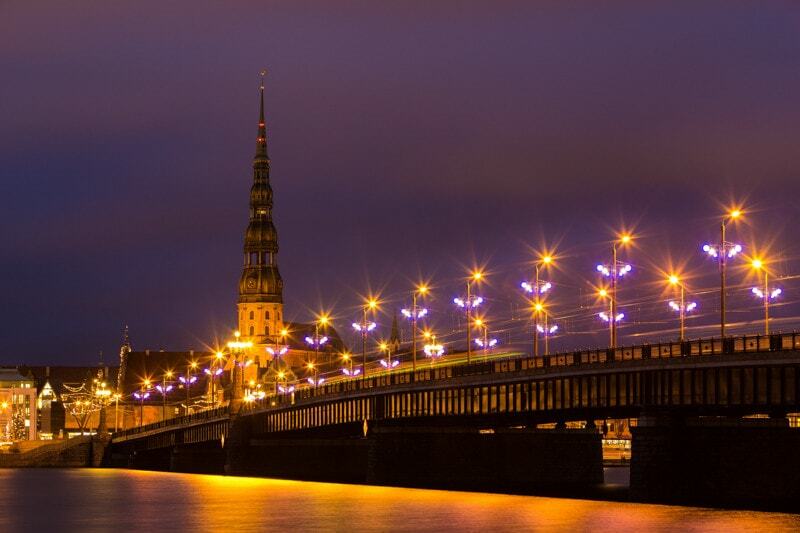 Especially high on my list, along with Tallinn, was Riga. 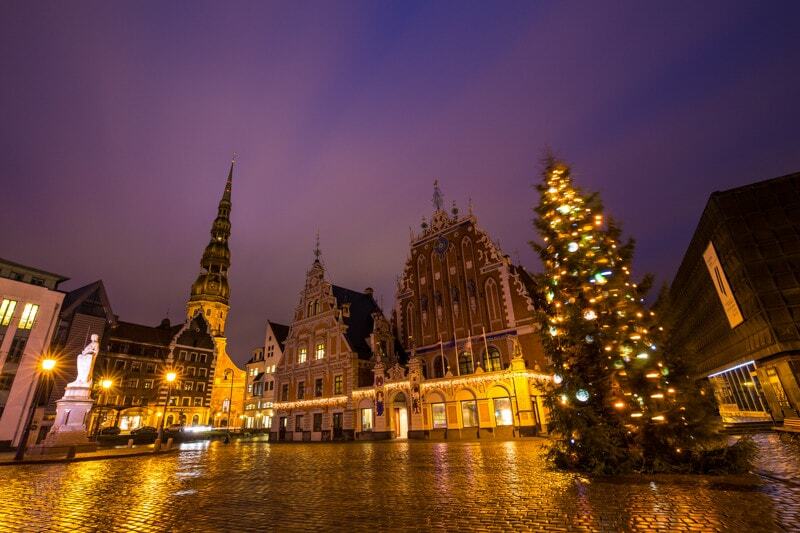 Riga is actual the home of the first ever decorated Christmas tree, or so the stories say. So, it was incredibly cool being in the city this time of year. Though I only had a couple short days in Riga, and well the weather wasn’t fantastic, I did find quite a few cool places in the city for photography. As is always the case, below you’ll find a video from my time in the destination along with information from the city and in this article a guide to the best places to photograph in Riga. 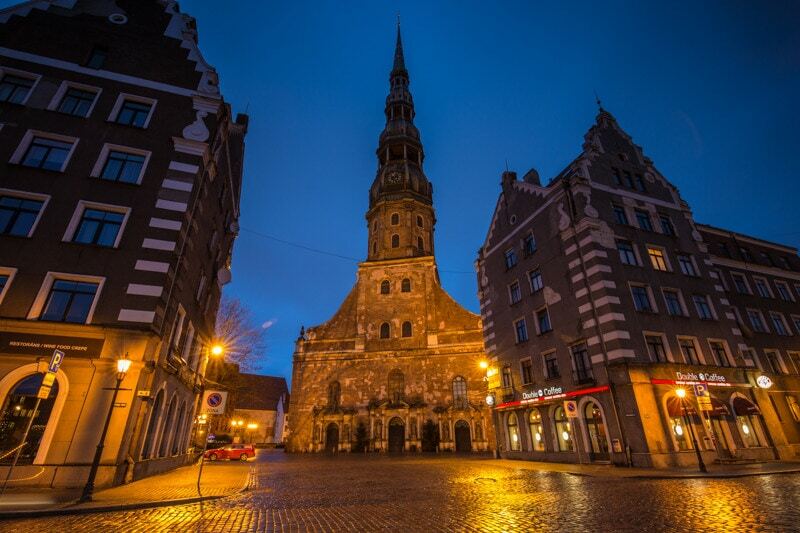 This is one of the classic locations for photography in Riga. The square in front of the old Cathedral is very cool, and in December the Christmas market is humming with activity. It probably the best place in town to shoot. The cathedral is lit both in the morning and and night, so if you want a quiet scene come here in the morning. If you want to add some street photography to your scene, come and shoot in the afternoon. Maybe even more iconic than Rigas Dom, the House of Blackheads is the presidental palace in Riga. I came here and photographed the square in the morning light, and was questioned (very nicely, and politely) by a captain in the national guard – he was wondering why I was photographing the house, and asked that I not photograph the faces of soldiers. For me, this is best photographed in the morning. Basically right across the street from House of Blackheads, this is the most impressive cathedral in Riga. In fact, it’s so big that it might actually be hard to capture in one frame. During parts of the year, it’s possible to climb the church tower and get really great shots of the city from above. Unfortunately for me, it wasn’t possible when I was there. 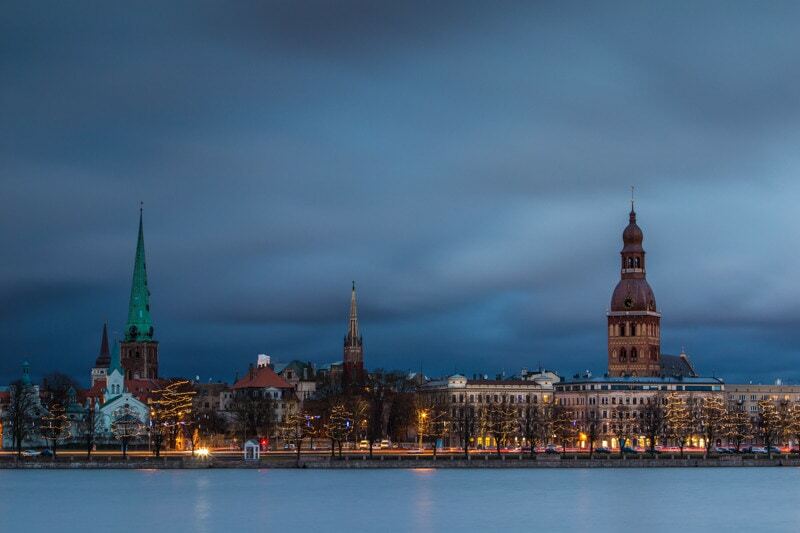 From across the river, you can get cool photos of all the cathedrals of Riga and the skyline. There are two different parks that you get to via the two bridges. 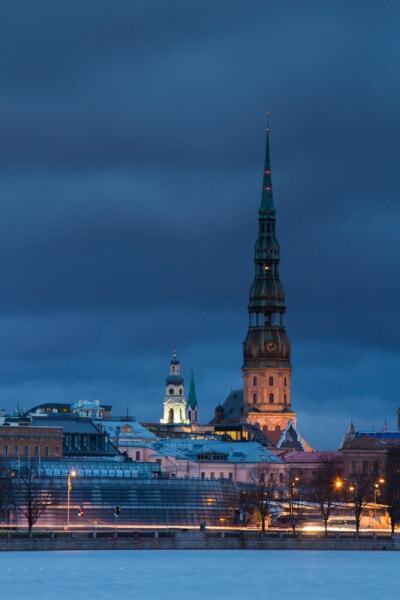 Both offer pretty good views of the Riga skyline. To capture the whole city in one frame, the park to the north works best. For more varied photos, and to pick out buildings with a telephoto lens, the longer park to the south is better. It’s basically impossible to photograph from both these locations on the same shoot as they are separated by a water way and you have to go all the way around the bay to get from one to another. I only shot images from the southern park. St. Peter’s Basilica from across the river. On the Riga side of the Akmens Tilts Bridge, there are a number of cool photos to be had. Of course, the bridge itself makes for a great photo, but you can also climb up on the north side of the bridge and photograph the skyline. From the south side of the bridge, you can get photos of the very cool and modern-looking Lativan National Library. I didn’t have enough time to head over and photograph the Latvian Academy of Science, but it’s a really cool – and massive – building that you should try to fit into your photography plan for the city. I was going to shoot some extreme long exposure photos of the building, but it rained midday when I wanted to shoot them. Next time, I guess. In general, I loved the vibe of Riga. It had a pretty good foodie scene, and the scene was definitely much more local than Tallinn. If you’re looking for a more local experience, this is a great alternative option to Tallinn. 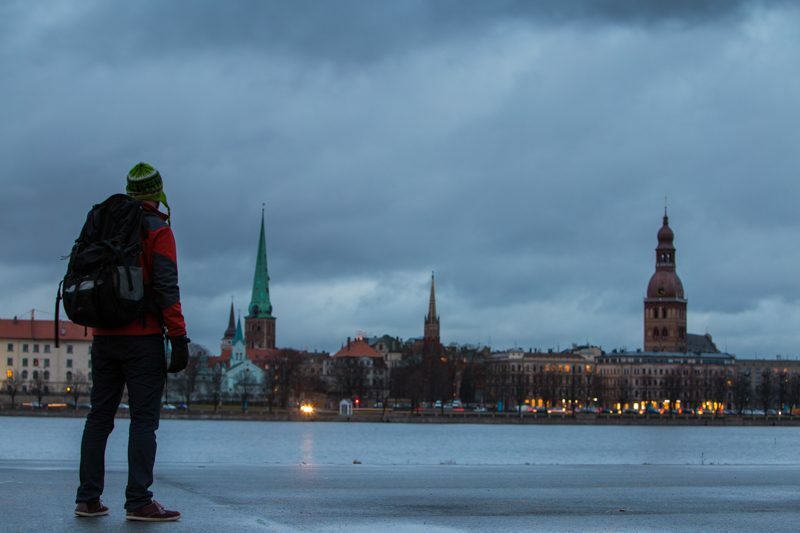 On arrival, I thought that Riga looked rough, then I started to feel that it looked gritty, and finally I left Riga feeling like it was a charming city. I’d love to go back to Riga at some point and do less photography, and more experiencing the city itself. As far as prices are concerned, they were about half of what they were in Tallinn (and it’s not like Tallinn is expensive). Food at restaurants was extremely reasonable, and my private room in the hostel cost 15 Euros a night (and it was right across from the main square). If you’re going to or from Riga to Vlinius or Tallinn, take the Lux Express buses. In fact, upgrade to their VIP seats. They are awesome. For only a slight bit more than the regular seats, you are just one seat in your row, rather than two, and you have your own TV with movies, table, and a cupboard for your things. Regardless what type of seat you get, there’s a coffee machine on board, and they give you water and snacks when you get on the bus. I thought it was fantastic service. Me enjoying the view of Riga. After Riga, I headed down to Vlinius where I spent Christmas Eve. From there, I headed into Poland for a week before hitting up Budapest, and the fabulous Aria Hotel there, for New Year’s Eve. Lots of fun still to come on the blog. Lovely photos and I’m glad you enjoyed the time. I would suggest to come back in summer time for a different experience + that’s when the Riga sensations have fully blossomed. Good luck on further travels. My next visit to Riga will definitely be in the summer, or maybe the spring. Hello! 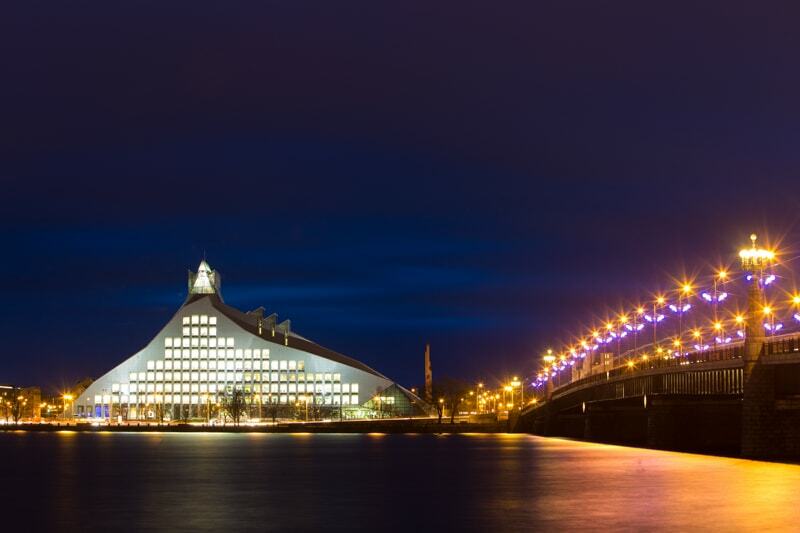 Beautiful photos of Riga – Riga Skyline, Bridge Scene and the Building – it is our National library building… One of the best photos of Riga I have ever seen on web.